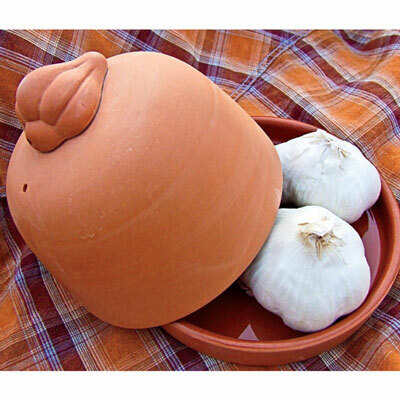 Terra Cotta Garlic Roaster | Henry Field's Seed & Nursery Co. There's nothing more delicious than the flavor of roasted garlic in your favorite potato, meat or pasta dish! This beautiful Terra Cotta Garlic Roaster is big enough to accommodate garlic of all sizes—even large, Elephant Garlic! Roasting is a convenient way to cook garlic and achieve many of the health benefits garlic has to offer. Easy to use, simply remove any loose, excess paper from the garlic, cut off the tops of each bulb. Soak the roasters vented lid in water to prevent the garlic from drying out and put in a conventional or microwave oven. A glazed interior base makes cleaning easy! 5" in diameter. For each offer ordered, get 1 garlic roaster.